Pastry flour contains a higher protein content than cake flour and is bleached a bright white. Pastry flour is a powder made from grinding the soft red winter or soft white wheat kernel. Pastry flour has the bran and germ removed, leaving only the starchy endosperm. Pastry flour is milled from soft wheat. Wheat is produced globally. Soft Red Winter Wheat is typically grown in the Eastern United States. Soft White Wheat is primarily grown in the Northwest United States. The wheat is harvested and delivered to flour mills to grind into flour. Commercial pastry flour is bleached. Wheat flour is the main ingredient in most baked goods. In bread, wheat flour provides gluten. Gluten is the key protein in the development of the dough’s protein matrix that traps air and gas molecules. In cakes and other applications, wheat flour provides the starch which helps form the structure via starch gelatinization. Bleaching the flour reduces the natural yellow pigmentation of the flour making it a brighter white. Wheat flour is composed of moisture (12%), protein (8-9%), fat (1%), carbohydrates (75%), and ash (0.4%). These values will vary based on the type of flour. For example, cake flour is milled from soft wheat resulting in lower protein (approx. 8%) and higher carbohydrate content. Bread flour is milled from hard wheat, resulting in higher protein (approx. 11%). It is required by the FDA to be enriched with thiamin, riboflavin, niacin, folic acid and iron. Pastry flour may be bleached or unbleached depending on the application. 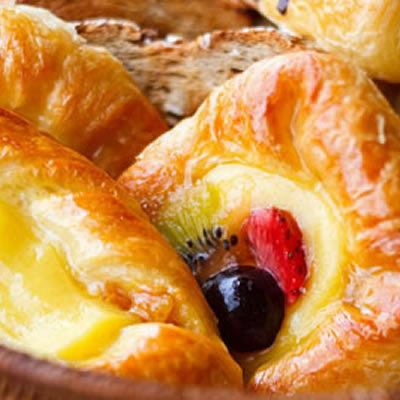 In pastries, flour is approximately 50% of the formulation. The flour must have good gluten quality and a protein content of 12-13%. Flour may be added in a multi-stage sponge and dough formulation, or all at once depending on the type of pastry and make up instructions. Wheat flour is very low in saturated fat, cholesterol, and sodium. When it is enriched, as required by law in the U.S., it is a good source of folic acid, iron, and B vitamins, as well as complex carbohydrates.